Mauna Loa is the largest volcano on earth. It is an active shield volcano, with a volume estimated at approximately 18,000 cubic miles (75,000 km³), although its peak is about 120 feet (37 m) lower than that of its neighbor, Mauna Kea, another of five volcanoes that form the Island of Hawaii. The Hawaiian name "Mauna Loa" means "Long Mountain." Lava eruptions from it are silica-poor, thus very fluid: and as a result eruptions tend to be non-explosive and the volcano has extremely shallow slopes. The volcano has probably been erupting for at least 700,000 years and may have emerged above sea level about 400,000 years ago, although the oldest-known dated rocks do not extend beyond 200,000 years. Its magma comes from the Hawaii hotspot, which has been responsible for the creation of the Hawaiian island chain for tens of millions of years. The slow drift of the Pacific Plate will eventually carry the volcano away from the hotspot, and the volcano will thus become extinct within 500,000 to one million years from now. Mauna Loa's most recent eruption occurred from March 24, 1984, to April 15, 1984. No recent eruptions of the volcano have caused fatalities, but eruptions in 1926 and 1950 destroyed villages, and the city of Hilo is partly built on lava flows from the late nineteenth century. In view of the hazards it poses to population centers, Mauna Loa is part of the Decade Volcanoes program, which encourages studies of the most dangerous volcanoes. Mauna Loa has been intensively monitored by the Hawaiian Volcano Observatory (HVO) since 1912. Observations of the atmosphere are undertaken at the Mauna Loa Observatory, and of the Sun at the Mauna Loa Solar Observatory, both located near its summit. Hawaii Volcanoes National Park covers the summit and the southeastern flank of the volcano, including a separate volcano, Kilauea. Mauna Loa is the world's largest shield volcano. Because its lava is extremely fluid (it has low viscosity), and its slopes are not steep, Mauna Loa is shaped like a shield. Eruptions are rarely violent, and the most common form is in the Hawaiian style, which involves lava fountains feeding lava flows. Typically, at the start of an eruption, a rift up to several kilometers long opens, with lava fountains occurring along its length in a so-called "curtain of fire." After a few days, activity normally becomes concentrated at one vent. Eruptions generally occur in three regions on the mountain: at the summit and in two rift zones extending northeast and southwest of the summit. Its summit caldera is called Mokuaweoweo; it is 1.75 to three miles (three to five km) in diameter. The caldera probably formed 1,000–1,500 years ago when a very large eruption from the northeast rift zone emptied out the shallow magma chamber beneath the summit, which then collapsed. Seismic data can reveal the locations of the magma chambers beneath the volcano which feed activity. Some types of seismic waves, known as "S-waves," cannot travel through liquid rock, so magma chambers cast 'shadows' in seismic data. Seismic shadows reveal a magma chamber about 1.75 miles (three km) beneath the summit and smaller magma bodies beneath the rift zones. The Hawaiian name "Mauna Loa" means "Long Mountain"
Trade winds blow from east to west across the Hawaiian islands, and the presence of Mauna Loa strongly affects the local climate. At low elevations, the eastern (windward) side of the volcano receives heavy rain, resulting in the city of Hilo being the wettest in the United States. The rainfall supports extensive forestation. The western (leeward) side has a much drier climate. At higher elevations, the amount of precipitation decreases, and skies are very often clear. 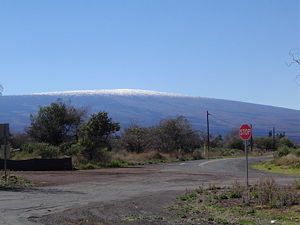 Very low temperatures mean that precipitation often occurs in the form of snow, and the summit of Mauna Loa is described as a periglacial region, where freezing and thawing play a significant role in shaping the landscape. Mauna Loa probably began erupting between 700,000 and 1,000,000 years ago and has grown steadily since then. Like all of the Hawaiian islands, Mauna Loa has its origins in a hotspot—a plume of magma rising from deep in the Earth's mantle. The hotspot remains in a fixed position, while the Pacific Plate drifts over it at a rate of about four inches (ten cm) per year. The upwelling of the hot magma creates volcanoes, and each individual volcano erupts for a few million years before the movement of the plate carries it away from the rising magma. The hotspot has existed for at least 80 million years, and the Emperor Seamounts chain of old volcanoes stretches almost 3,600 miles (5,800 km) away from the hotspot. Currently, the hotspot feeds activity at five volcanoes: Mauna Loa, Kilauea, and Hualalai on the Big Island, Haleakalā on Maui, and Loihi, a submarine volcano south of the Big Island and the youngest Hawaiian volcano. Mauna Loa is the largest of these, although Kilauea is now the site of the most intense volcanic activity. Prehistoric eruptions of Mauna Loa have been extensively analyzed by carrying out radiocarbon dating on fragments of charcoal found beneath lava flows. The mountain's prehistoric activity is probably the best known of any volcano. Studies have shown that a cycle occurs in which volcanic activity at the summit is dominant for several hundred years, after which time activity shifts to the rift zones for several more centuries, and then back to the summit again. Two cycles have been clearly identified, each lasting 1,500–2,000 years. This cyclical behavior is unique to Mauna Loa among the Hawaiian volcanoes. Records show that between about 7,000 and 6,000 years ago Mauna Loa was largely inactive. The cause of this cessation in activity is not known, and no known similar hiatus has been found at other Hawaiian volcanoes except for those currently in the post-shield stage. Between 11,000 and 8,000 years ago, activity was more intense than it is today. However, Mauna Loa's overall rate of growth has probably begun to slow over the last 100,000 years, and the volcano may in fact be nearing the end of its tholeiitic basalt shield-building phase. 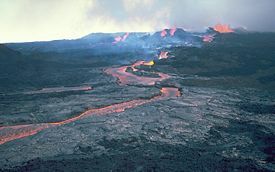 Lava fountains feed ʻaʻā lava flow in March 1984. Although native Hawaiians have witnessed eruptions for many centuries, written records exist only for eruptions that have occurred since the early 1800s. The first historical eruption occurred in 1843, and since then 33 eruptions have been documented. In total, these eruptions have covered over 310 square miles (800 km²) of the volcano's flanks with lava flows. Typically, eruptions have been brief but intense, with 0.06 to 0.12 cubic miles (0.25–0.5 km³) of lava erupted over a few weeks. An especially big eruption in 1935 was large enough that its lava flows threatened Hilo, leading to an unusual employment of air power. Five bombers of the 23d and 72d Bombardment Squadrons of the United States Air Force dropped bombs ahead of the lava in order to divert it away from Hilo. Until 1950, eruptions occurred roughly every three to four years, but since then the repose periods have dramatically lengthened with the only eruptions occurring in 1975 and 1984. The two most recent eruptions have been the most extensively studied. The 1975 eruption lasted a short two days and occurred at the summit of the mountain. The 1984 eruption saw fissures open up to the northwest and southeast, from the summit down to 9,500 feet (2,900 m) above sea level. 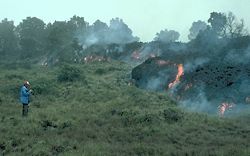 Flows from this eruption headed rapidly towards Hilo again, but stopped about 2.5 miles (four km) from the outskirts when the eruption ended after three weeks. 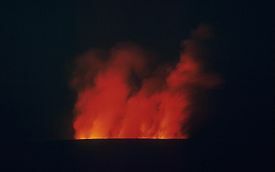 Mauna Loa erupting in 1984. The volcano's last eruption was in 1984. Seismic activity remained low until 2002, when there was a sudden onset of inflation, and the caldera walls began to move apart at a rate of two inches (five cm) per year. This is thought to indicate that magma is filling a reservoir about 3.1 miles (five km) beneath the summit. The inflation has been accompanied by increased seismic activity. A swarm of deep earthquakes began in July 2004, and continued until the end of the year. Earthquakes were detected at a rate of one per day for the first three weeks, increasing steadily over subsequent months to 15 or so per day by the end of the year. The swarm ended in December 2004, and earthquake levels have been only moderately elevated since then. Diagram showing the volcanoes that form the Big Island of Hawaii. Kīlauea is another active volcano in the Hawaiian Islands. It is currently the most active volcano and one of the most visited active volcanoes on Earth. It lies on the southern flank of Mauna Loa and was originally thought to be a satellite vent of Mauna Loa. However, chemical differences between the lavas from the two volcanoes show that they have separate shallow magma chambers. They are now considered separate volcanoes. Nevertheless, activity patterns at the two volcanoes do appear to be correlated. The most apparent relation between the two mountains is that, generally, periods of frequent activity at one volcano coincide with periods of low activity at the other. 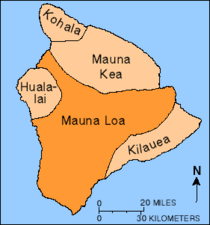 For example, between 1934 and 1952, Kīlauea was dormant and only Mauna Loa was active, while from 1952 to 1974, only Kīlauea was active while Mauna Loa lay dormant. The 1984 eruption of Mauna Loa began during an eruption at Kīlauea, but had no discernible effect on the Kīlauea eruption. Occasionally, though, eruptions at one volcano do seem to influence activity at the other. The recent inflation of Mauna Loa's summit began on the same day as a new large lava flow broke out at Kīlauea's Puʻu Ōʻō crater. Lava flow overruns vegetation during the 1984 eruption. 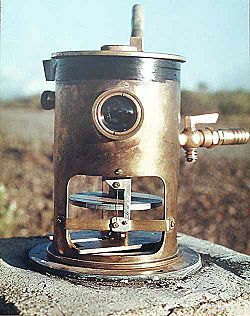 A tiltmeter on Mauna Loa, used to predict eruptions by measuring very small changes in the profile of the mountain. Volcanic eruptions in Hawaiʻi rarely cause fatalities—the only fatality due to volcanic activity there in the last century occurred at Kīlauea in 1924, when an unusually explosive eruption hurled rocks at onlookers, killing one. However, property damage is common. Mauna Loa is a Decade Volcano, which means it has been identified as worthy of particular research in light of its frequent eruptions and proximity to populated areas. Many towns and villages near the volcano are built on lava which has erupted in the last two hundred years, and there is a very strong likelihood that future eruptions will cause damage to populated areas. The main volcanic hazard at Mauna Loa is lava flows. Most flows advance at about walking pace and present little danger to human life, but eruptions at Mauna Loa can be more intense than those at Kīlauea; for example, the 1984 eruption emitted as much lava in three weeks as Kīlauea's current eruption produces in three years. Such high emission rates can generate comparatively fast-moving flows. A greater but rarer hazard at Mauna Loa is the possibility of a sudden massive collapse of the volcano's flanks. Deep faults allow large portions of the sides of Hawaiian mountains to slide gradually downwards, the best known example being the Hilina Slump. Occasionally, a large earthquake can trigger a collapse of the flank, creating a massive landslide which may trigger a tsunami. A recent example of the risks associated with slumps occurred in 1975, when the Hilina Slump suddenly moved forward by several yards. A magnitude-7.2 earthquake resulted which triggered a small tsunami with a wave height of a few yards. Mauna Loa is an intensively monitored volcano. 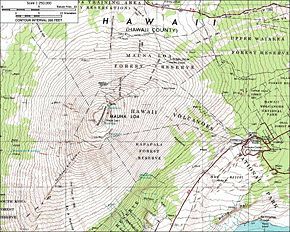 The Hawaiian Volcano Observatory (HVO) was established in 1912 to observe the Hawaiian volcanoes, and the HVO has developed many techniques to help predict when eruptions at Mauna Loa and other volcanoes are imminent. One of the most important tools is seismometry. More than 60 seismometers around the Big Island enable scientists to measure the intensities and locations of hundreds of small earthquakes every week. Earthquakes can begin to increase years before an eruption actually starts: The 1975 and 1984 eruptions were both preceded by one to two years of increased seismic activity at depths of less than eight miles (13 km). Another type of seismic activity occurs in the hours preceding an eruption. So-called harmonic tremor is a continuous "rumble" which contrasts with the normal seismic activity of sudden shocks and is believed to be caused by the rapid movement of magma underground. Volcanic tremor normally indicates an imminent eruption, although it may also be caused by shallow intrusions of magma which do not reach the surface. Another important indicator of what is happening underground is the shape of the mountain. Tiltmeters measure very small changes in the profile of the mountain, and sensitive equipment measures distances between points on the mountain. As magma fills the shallow reservoirs below the summit and rift zones, the mountain inflates. A survey line across the caldera measured a three-inch (76 mm) increase in its width over the year preceding the 1975 eruption and a similar increase before the 1984 eruption. The elevation and location of Mauna Loa have made it an important location for atmospheric monitoring by the Global Atmosphere Watch and other scientific observations. The Mauna Loa Solar Observatory (MLSO), located at 11,155 feet (3,400 m) on the northern slope of the mountain, has long been prominent in observations of the Sun. The NOAA Mauna Loa Observatory (MLO) is located close by. From its location well above local human-generated influences, the MLO monitors the global atmosphere, including the greenhouse gas carbon dioxide. 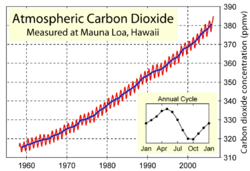 Measurements are adjusted to account for local degassing of CO2 from the volcano. ↑ Using GIS to estimate the total volume of Mauna Loa Volcano, Hawaii Kaye G.D., 98th Annual Meeting Geological Society of America, Retrieved March 7, 2008. ↑ Mauna Loa: Earth's Largest Volcano USGS. Retrieved March 7, 2008. ↑ General Info Hawaii Center for Volcanology. Retrieved May 17, 2016. ↑ When did the summit caldera of Mauna Loa form? USGS, Hawaiian Volcano Observatory. March 22 2001. Retrieved March 7, 2008. ↑ Robert Decker and Barbara Decker, Volcanoes (New York: Freeman, 1997, ISBN 987-0716731746). ↑ J.P. Lockwood, "Mauna Loa eruptive history - the preliminary radiocarbon record," in Rhodes, J.M. and Lockwood, J.P. (eds. ), Mauna Loa revealed: structure, composition, history, and hazards (Washington DC: American Geophysical Union Monograph 92, 1995), 81–94. ↑ Eruption History of Mauna Loa Volcano United States Geological Survey, Hawaiian Volcano Observatory. Retrieved March 7, 2008. ↑ 1935 eruption USGS. Retrieved March 7, 2008. ↑ Inflation of Mauna Loa Volcano slows USGS. Hawaiian Volcano Observatory, Jan. 23 2003. Retrieved March 7, 2008. ↑ The 1924 explosions of Kilauea USGS, Hawaiian Volcano Observatory. Retrieved May 17, 2016. This page was last modified on 4 September 2018, at 15:40.